They are every where you look! while you are traveling on the road you pass oil tankers, cement mixers and even storage tanks on the back of articulated lorries. At the side of the road passing a bakery they have big vessels outside for storing their flour . And as we carry on with our journey there are work factories that have containers and all sorts of other storage tanks and vessels and if we just happen to pass one of our yards you will be amazed at what you will see you just cant get away from them, and hear at Petre Process we cater for such a large range of industires, our stock levels are vast. How the largest stock of used machinery equipment in Lancashire Can Benefit Your Business. Petre Process is an undisputed leader in supplying high quality stainless steel machinery equipment to manufacturing businesses all over the UK. But did you know that we also supply a large range of used equipment? Here are some of the ways that our extensive stock selection can benefit your business right here and now. When a critical piece of equipment stops working, it often creates a domino effect in your manufacturing process. No company can afford breakdowns were time and money are lost and dead lines have to be met, especially not in this difficult economic climate. Our large stocklist means that you are likely to find the used machinery equipment you require, without wasting valuable time searching all over for it. Our user-friendly website makes it simple for you to view our stock 24/7 most of our items are also pictured and dimensions given so when you order you can be absolutely sure you are getting just what you are looking for. Large Range to Choose From. Because we have such a large stocklist, we can serve many more industries than most of our competitors. Below is a list of businesses that our company caters for, whether its from a agitater to a tank or even a valve we’ve got it covered. and food companies to name a few. It is our company policy to maintain a wide range of stock of used equipment through a vast list of contacts. If you are looking for it, we have it or if we don’t we can find it for you quickly. Because you are buying used machinery, you will be saving large sums of money over purchasing new and you will be getting tried and tested equipment that will get your business back in business, Job Done! Petre Process is committed to providing reliable used machinery and equipment at the lowest possible prices to help keep your business running and growing. Visit us today and see why our company is setting the standard for excellence. With today’s fuel prices outgrowing inflation the cost of filling up our tanks is a major talking point and alternative fuels are constantly being discussed. One such fuel is bio-diesel. Bio-diesel is an alternative fuel that can be produced from straight vegetable oil, animal oil/fats, tallow and waste cooking oil. A process called transesterification is used to convert these oils to Bio-diesel. Possible source of suitable oil comes from crops such as rapeseed, palm or soybean, rapeseed represents the greatest potential for bio-diesel production in the UK. Most bio-diesel produced at present is produced from waste oils sourced from restaurants, chip shops Waste vegetable oil can often be sourced for free or sourced already treated for a small price. 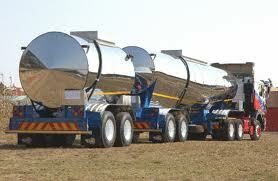 (The waste oil must be treated before conversion to bio-diesel to remove impurities). The result is Bio-diesel a fuel that can compete with fossil diesel. 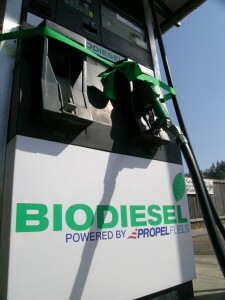 The main benefit of bio-diesel is that it can be described as ‘carbon neutral’. This means that the fuel produces no carbon in the form of carbon isdioxide. Bio-diesel is rapidly biodegradable and completely non-toxic, this mean spillages represent far less risk than fossil fuel spillages. 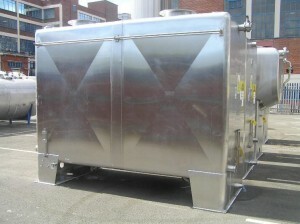 Petre Process Plant Ltd can supply new, used and reconditioned bio-diesel storage tanks. 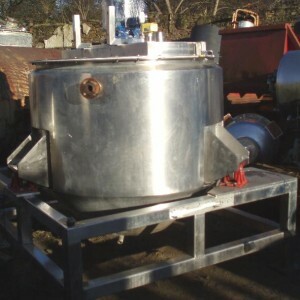 1 off- Used 440 gal (2000 L) 316L stainless steel jacketed enclosed hemispherical bottom mixing vessel measuring 4′-11 7/8″ (1520mm) dia x 2′-3″ (685mm) straight shell height, internal height 4′-9″ (1448mm), with a hemispherical bottom and a flat top with a 1/3 hinged cover, free standing on a stainless steel framework giving a clearance of 10″ under outlet. 2 off -10″ diameter 3 bladed marine propellers and 1 off- 10″ diameter 4 bladed pitched axial flow impeller, all driving downwards. Vessel is supported on 3 off load cells. A stainless steel operating platform is accessed by steps. 1 off- Used 385 gallon (1750L) stainless steel Silverson Mixing Vessel (jacketed in Mild steel) but the vessel is lagged and clad in stainless steel.l, measuring approx. 4′-9″ dia x 4′-7″ internal depth. Driven by a Brook Hansen Flange mounted motor 11kW, 975rpm drive. Frame size DA160L. The vessel is c/w lids,and one part is ia a hinged section. 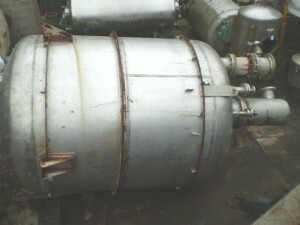 1 off – Used 16.67cu.m 3670 gallon HASTELLOY C 276 PRESSURE VACUUM VESSEL. Details of Hastelloy Metal Here. for more information on this or other PROCESS EQUIPMENT. 2.5m Dia. x 2.5m shell height plus 670mm dished ends.